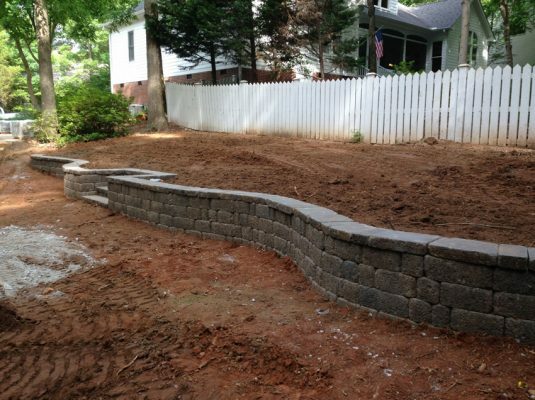 Grading | Cary Landscape Inc.
Grading provides the very foundation for your entire landscape. Proper grading will allow you to maximize the use of your property. The two general purposes for grading are necessity and enhancement. However, finding a way to fulfill both of these can be difficult. Many factors must be considered before determining the final grade of a property, though none more important than allowing for proper drainage. If water does not flow away from a structure, serious damage can result to the foundation. Poor drainage in the lawn and planting areas will prevent intended vegetation from thriving. In addition to allowing for proper drainage, it’s extremely important to create the best possible grade to accommodate the site’s intended use. Each element in the design of a property has a recommended percentage of slope. Veering too far from the recommended percentages will make an area unmanageable, unusable, and sometimes unsafe.